In what now seems like another life I was once a 16 year old grunger. I wore scuffed up doc martin boots, black jeans and thought Sonic Youth, Dinosaur Jr and Faith No More were cool. I cried when Kurt Cobain died. Whenever possible I would take a bus to London and would see bands play at The Camden Palace (now Kokos) and spend a lot of time on Oxford Street buying terrible clothes and obscure records. My parents’ friends used to tell me to polish my boots and my auntie used to look despaired when she saw me turn up in black yet again. It all made sense to me, I was wearing my musical taste and anyone who dressed differently was just not cool. Hundreds of miles away, my future husband was busy growing freaky hair braids and wearing huge boots. This all changed within a couple of years and as I began to introduce brighter colours into my wardrobe (and music collection), made new friends and gained more freedom, life and my musical taste were never the same again. I often think music collections can tell a lot about peoples’ lives, like soundtracks to different phases. A lot of people talk about how a certain song reminds them of a feeling or a time in their life maybe in the same way certain smells can fill us with fear or comfort. 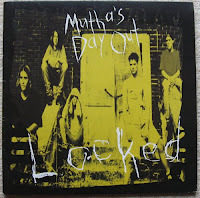 On a recent trip to see my parents, I picked up some of my old record collection and came across a 10” record called 'Locked' by a band called 'Mutha’s Day Out'. Never heard of them? That’s because they only released one album before they disbanded. I saw them play at The Camden Palace because I fancied one of the guys from a photo I had seen in a music magazine; I think it might have been Rodney. They wore dungarees, had long hair and their songs had a lot of shouting and Faith No More type guitar sounds; all the ingredients I thought necessary to make a great band. I had long forgotten about them so thought I’d look up what they are up to now. Mikal is married, has two daughters, and is in a christian rock band called Gazer. Chuck and his brother Phillip are in a doom metal band called Deadbird. Jeff is in a doom metal band called Rwake, but has reportedly returned to Batesville to nurse his ailing son back to health from heart problems, but will return soon to Little Rock. Brice has a band called Nite Time Flu and jams with Jeff and Rod every now and again. Rod is "doing great," according to Brice. Lance now owns a recording studio in Batesville and does work on farms with chickens. Randy is a bank teller. All grown up with kids and 'real jobs'. I hope Jeff’s kid gets better. Amazingly I don’t think this song has dated too badly. When I was sixteen I wore Chelsea boots and listened to the Beatles, and drank like a fish. Plus ça change!